Martin HC Russell, Her Majesty’s Deputy Lieutenant of Greater London and the Lord-Lieutenant’s Representative for Barnet, has been awarded an honorary degree at Middlesex University. He was presented with the award at the University's graduation ceremony on Monday 13 July. Founder of financial and business educator Russell and Associates, Barnet-based Martin has worked in the treasury and corporate finance sector of two FTSE 100 companies, after a short time in the Army in the 1970s. He has trained many staff in government departments and agencies including the Bank of England, City of London Corporation and MPs, as well as lecturing at the University's Business School giving students practical and real world advice. Hampstead-born Martin is patron, president, chairman or trustee of a number of uniformed and civilian voluntary organisations, and a fellow of the Association of Corporate Treasures since 1981. 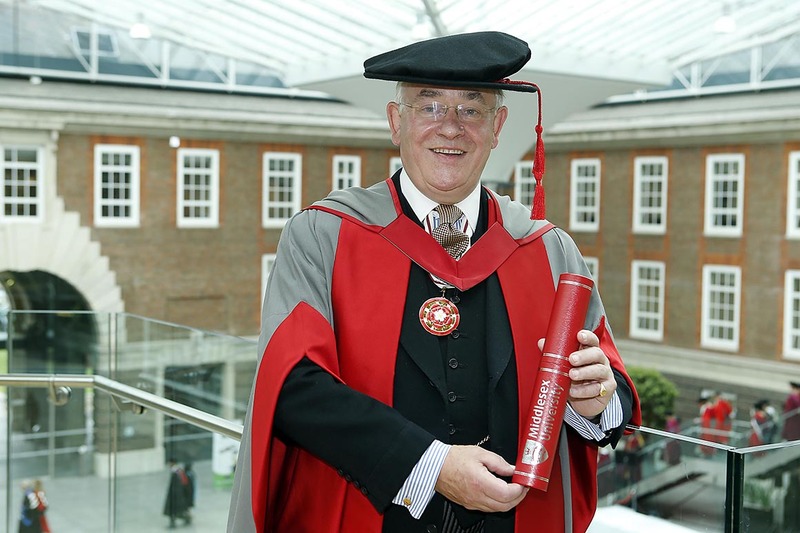 Commenting on his honorary degree, he said: "My long involvement with Middlesex University through a variety of public engagements, and more recently as a lecturer, makes the award of this honorary doctorate a significant privilege, and I consider it sealing our mutual association, of which I am very proud. "I shall do all in my power as the Representative Deputy Lieutenant to promote the continuing development of our splendid seat of learning at the heart of this Borough." Middlesex University Vice-Chancellor Professor Michael Driscoll said: "Martin is a key figure in Barnet and represents the borough in the Greater London Lieutenancy. He has had an esteemed career across several sector and his contributions to Barnet continue to bring the area to the forefront of activity across London. "It was a privilege and honour to welcome Martin to the University and present him with this award."